At the Geneva Motor Show Bertone presented an unusual body built on a production platform from the front wheel drive Citroën GS (four-cylinder 1015 cc air-cooled boxer engine, bore and stroke 74×59 mm, 55.5 hp at 6500 rpm) with hydro-pneumatic suspension and braking systems exclusive to the French manufacturer. On GS mechanics, Bertone designed a sports car called the Camargue, with a 2+2 body in which a long sloping rear window appeared separate from a kind of roll-bar, which also helped to make the whole body more rigid. The front end had a small radiator grill under the bumper bars, while the flanks were given the considerable sloping of the ample wraparound windscreen with heavily inclined pillars. 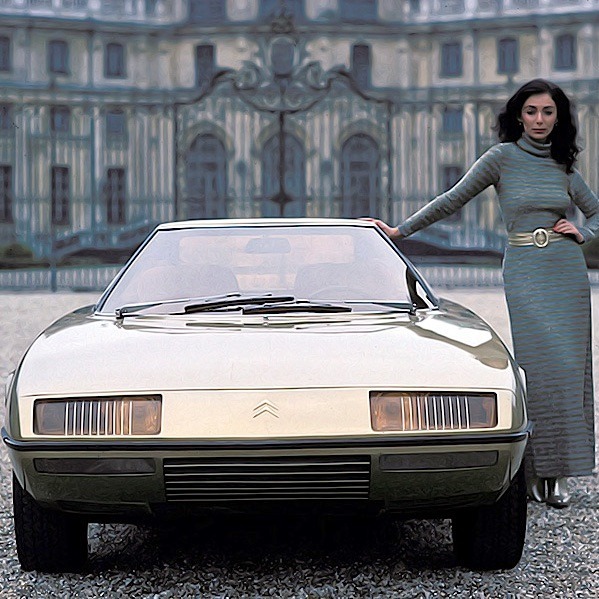 The Camargue retained the Citroën GS saloon’s 4115 mm length, its width went from the original car’s 1608 to 1680 mm – also due to a 60 mm increase in the tracks – while the height was reduced by 200 mm from that of te standard production car to 1150 mm.